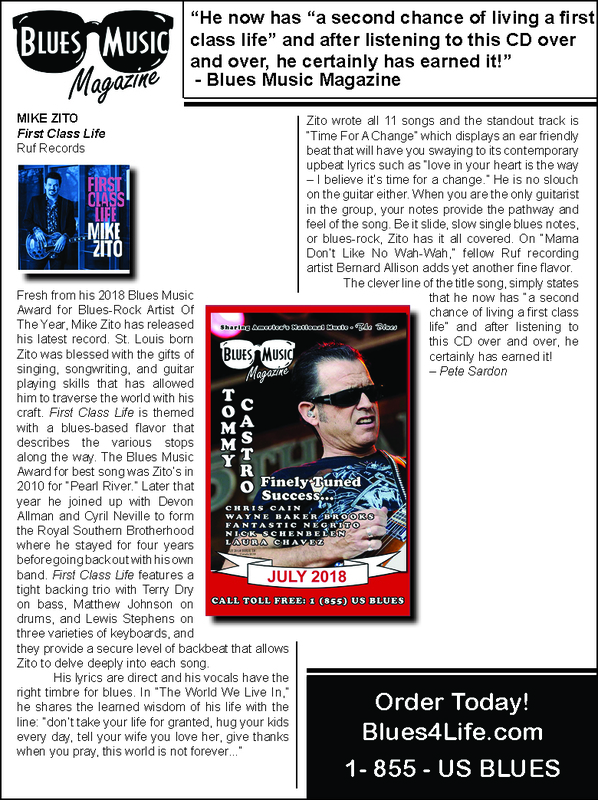 "Blues-rock is a tightrope - and Mike Zito has never lost his footing. At times in his storied two-decade career, the Texas bandleader has rolled up the amps and rocked as hard as anyone. Yet his lifelong fascination with the blues has always reeled him back in. And now, having shaken the rafters with 2016's acclaimed Make Blues Not War, First Class Life finds Mike diving deep into the only genre that can do justice to his hard-won true stories of hardship and redemption. "Make Blues was pretty extreme and rocking," he reflects. "This time, I was definitely thinking more blues." Released in 2018 on Ruf Records, First Class Life is a fitting album title from a man who remembers the hard times. "The title track is a nod to where I've come from and where I'm at," explains the songwriter whose promising early career was almost destroyed by addiction. "It's a rags-to-riches story, and it's certainly true. I grew up poor in St. Louis, and now I'm travelling the world to sing my songs. In the world of excess America, I may not look 'rich', but in my world, I most certainly am. I have a beautiful family, I'm clean and sober, and I get to play music." And what music. Since Mike's debut album, Blue Room (1997), there have been countless creative peaks, from 2011's confessional Greyhound, through his world-conquering contributions to US supergroup the Royal Southern Brotherhood, right up to recent solo triumphs like Gone To Texas (2013), Keep Coming Back (2015) and Make Blues Not War (2016).